The Help entry and each of its subentries in the Index are links to web pages. Dragging each of these entries to the work space will open a web page in an Internet browser. Dragging any of the subentries for Help to the work space will attempt to open online versions of web pages. An Internet connection is, therefore, required to view the web pages for Homepage, What’s New, Report Bug, License, and About. 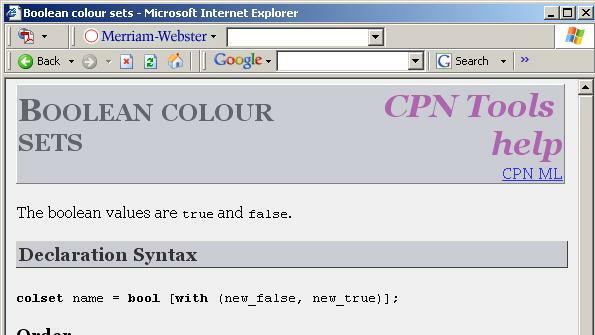 The words CPN Tools help in the upper-right-hand corner of every help page is a link. Clicking on that link will bring you back to the main help page. If a help page is associated with a particular category, then there will be a link to the main page for that category in the upper-right-hand corner of the help page. 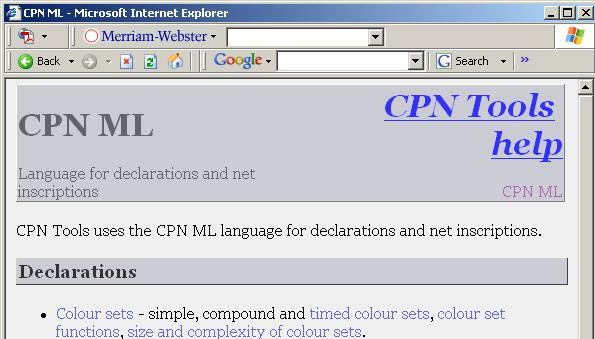 Here is an example of a page that is associated with the CPN ML category. There is no comprehensive index or single overview of all of the help pages. However, the main help pages for the categories mentioned above provide an overview of most of the topics covered by these help pages.